Here is yet another indicator that private investment demand is yet to take off in India. The rush of new share sales this year has very little to do with raising growth capital, but with promoters and early-stage investors cashing out. 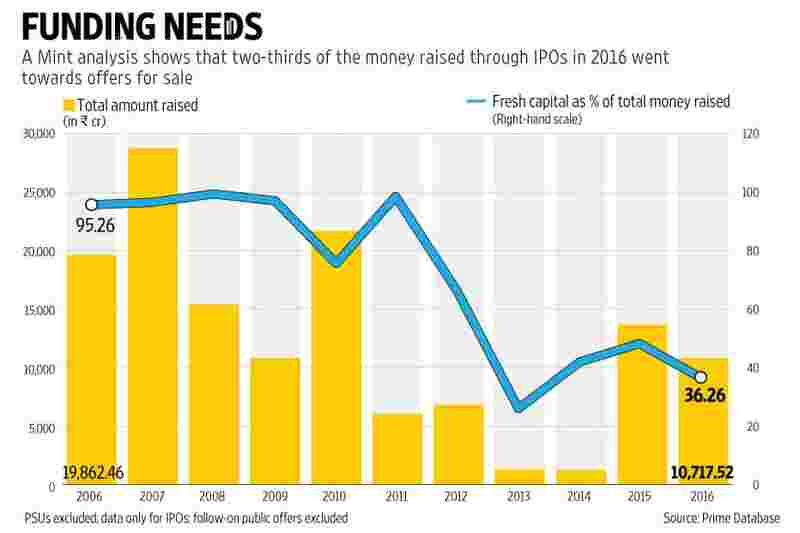 A Mint analysis shows that two-thirds of the money raised through initial public offerings (IPOs) in 2016 went towards offers for sale—essentially exits for existing investors. Only about a third went towards growth capital. This is the lowest in the last at least 10 years, barring 2013 when only about a quarter of money raised went towards expansion and capital investment. So far this year, 16 companies have raised ₹ 10,717 crore through initial public offers. “Secondary market transactions do not create capital formation. The recent IPO activity was more to provide exits to private equity and venture capital funds," said Prithvi Haldea, founder-chairman of Prime Database Ltd, which tracks primary market activity. The trend is in contrast to the IPO boom of a decade ago when bigger issues hit the market and most of the money was raised for expansion. For instance, 96.2% of the ₹ 28,600 crore raised in 2007 was fresh capital. The proportion of money raised for capital expansion has come down through the years as a slow economic recovery and issues such as land acquisition problems and lack of fuel supply stalled industrial projects. Investment demand growth in India has languished at sub-5% for the last four financial years. Volatility in the secondary markets and stressed corporate financials also hurt valuations in the years following the 2008 crisis, making companies reluctant to raise money from equity issues. But while a rising tide of liquidity has pushed up the Sensex and lifted sentiment across the board since February, it has mostly resulted in promoters and private equity investors exiting their investments at higher valuations. In any case, the fact that the money raised is not growth capital shouldn’t matter to investors, said investment bankers. “Investors are indifferent towards a primary issuance versus a secondary offer for sale... All they are looking for is whether the company is very well positioned in its space and can deliver multi-years of growth, that it has a quality management team, sound systems and processes in place, robust margins and cash flows to keep performing consistently and is a capital-efficient company," said V. Jayasankar, senior executive director and head of equity capital markets at Kotak Mahindra Capital Co. Ltd.
Jayasankar cited the examples of companies such as Dr. Lal PathLabs Ltd, Manpasand Beverages Ltd, S.H. Kelkar and Co. Ltd and small finance bank licensee Ujjivan Financial Services Ltd that are uniquely positioned in their sectors. Each of these companies offered at least 30% returns from the respective issue price to investors in the first month of listing. “Investors are not concerned if a company is coming to the market to give an exit to a PE investor or to raise growth capital. It may already have raised growth capital a few years ago. As long as it’s a great company to own, investors will be eager to invest in the company," he added. As foreign institutional investors continue to favour India, it is likely that last year’s fund raising of ₹ 13,614 crore will be overtaken in 2016, said investment bankers. At least two dozen companies have lined up with new share sale proposals as well as valid regulatory approvals to launch their public issues. They have the potential to raise anywhere between ₹ 7,000-10,000 crore, with some large-ticket IPOs such as ICICI Prudential Life Insurance Co. Ltd and Vodafone India Ltd, the country’s second largest telco by subscriber base, on the anvil.